February 28 is Rare Disease Day. Help us raise awareness and funds for Rare Disease Day and Shwachman Diamond Syndrome this month! Join us in our challenge — Dare to Cure Rare! 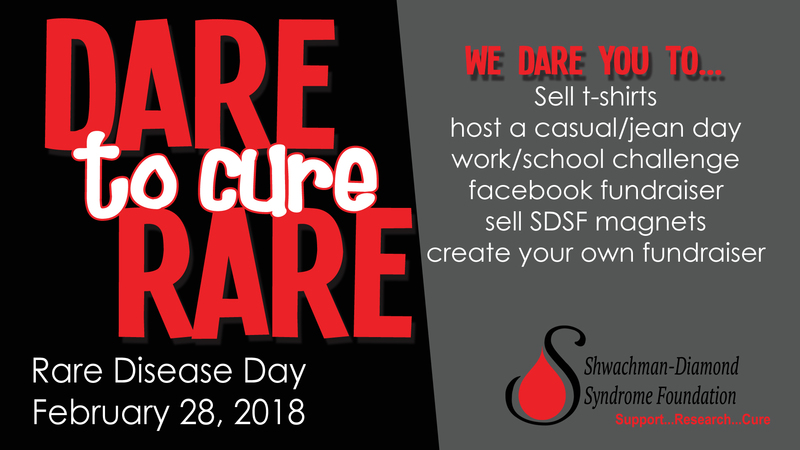 We challenge you to create a fundraising campaign this month–whether it is selling t-shirts, hosting an event, creating a fundraiser on facebook, organizing a “dress down day” at your work or child’s school, selling SDSF magnets or creating your own fundraiser! Join us to raise awareness and fund a cure!